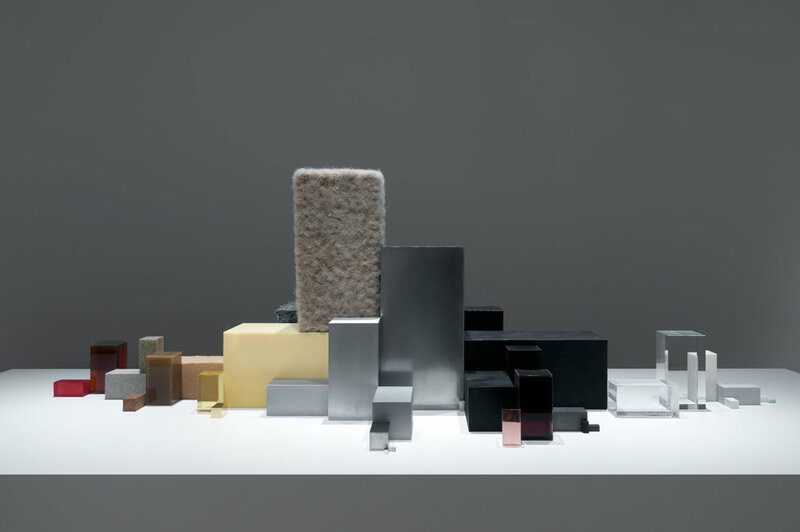 Everyday products such as a vacuum cleaner, Volkswagen Beetle, pencil, or PET bottle have been reduced to the exact quantity of the specific raw materials from which they are made, shown in the form of rectangular blocks. Since the Renaissance, scientists have probed the world systematically, using reason and observation to unveil the mysteries of nature, to understand its materiality, and begin to question humanity’s relationship to it. That process which began centuries ago has yielded immense knowledge but also the realization that it is all but a drop in the ocean of what is knowable. During the same time, civilization has introduced millions of new ‘artificial species’ through the ecosystems of commerce, objects that support our pleasant, contemporary existence and contain myriad materials forged together by design. Yet, we feel disconnected from this materiality today, blind to the inner workings and composition of all these artificial things, much as we might have looked at the night sky and felt ignorant about the moon and stars in the days before the Renaissance. For Materialism we ‘de-produce’ the produced, deconstructing familiar things about which we tend only to consider their function. We make clear how much of the matter within these objects is extracted from the earth. In the process, we reverse the mandates of engineering required for mass production which are standardization, modularization, and abstraction. We essentially create uniqueness, unity, and ‘de-abstraction’ in the form of simple geometric blocks. These blocks of varied, pure color make visual rhymes with the earliest works of Abstract art such as the paintings of Kazimir Malevich, Hilma af Klint, and Piet Mondrian. And, although the goal of ‘de-abstraction’ may sound opposed to the work of these 20th century artists, the purpose of their work and of Materialism is actually aligned: to make the essential nature of the world visible. In one example, we completely dissected a Volkswagen Beetle, to the level of the smallest component, then organized all of these by their material and measured each group’s accumulated mass. These masses are represented in 42 pure material volumes that begin to tell a variety of stories. The automobile, from 1980, contained surprising amounts of horsehair, cotton, and cork, amongst other unexpected commodities. These relate a tale about availability, tradition, and the state of our technical and material knowledge almost four decades ago. The collection of cubes also hints at the tangle of military engagements and the persisting forms of mercantilism of that era. Control over raw materials is still at the heart of numerous geopolitical tensions and, while we might like to think of these as a matter for politicians, we are all implicated. Everything we buy and consume has an impact, reinforcing complex systems of resource extraction, labor, manufacturing, and distribution. Materialism works to reveal the dimensions of our materialism these systems feed, illuminating our excessive use of the earth’s gifts, irreplaceable matter that we incessantly rip away from it, squander, and then dispose of with little thought. Understood this way, in pursuit of the most basic things, like a pencil or a plastic water bottle, we are collectively acting as a deviant child stealing from his mother. For Materialism, we also took apart and created volume sculptures of other objects, such as a light bulb, bicycle, vacuum cleaner, and a plastic bag from a local supermarket. One of the most startling discoveries in the course of our hands-on research was the significant amount of plastic and copper that is used for a single meter of electrical cable, an utterly ubiquitous product. This leads us to imagine vividly how many hundreds of meters of cable can be found in our very studio, in our home city of Amsterdam, in the world. The billions of kilos of copper and plastic, if represented by Materialism, would make blocks that would soar upwards past the clouds. If humankind could somehow perceive this connection to materials, to our collective consumption and the earth it impoverishes, it would be a leap in our social evolution, in building an awareness that we must somehow become better stewards of our future.